On the outskirts of a forest reserve in northern Malawi, local rural communities cut down trees. They know trees are important. They know that its probably a bad thing to cut down the trees. But the trees appear abundant and the wood is important — for cooking, for warmth, or to sell to others to gain some cash. And the land is even more important, because without expansion of the agricultural areas, there won’t be enough to eat. The alternative to growing your own food… well, you buy it, and in rural Africa, firewood (or charcoal) is an obvious way to make cash. Three things caught my attention last week. Firstly, the US government announced new guidelines on diet — they replaced their “food pyramid” with “My plate”, a simplified graphic to get across the message of what constitutes a healthy diet. Secondly, Oxfam released a report highlighting the looming global challenge that is food security — the effective (affordable) feeding of the world’s population in a way that doesn’t wreck the world’s ecosystems in the process. And finally, the BBC Radio 4 Food Programme had an article on gourmet burgers. This convergence of overlapping topics inspired the following data graphic. "My plate" represents what an "average me" (in the United Kingdom) eats in a day, by weight. 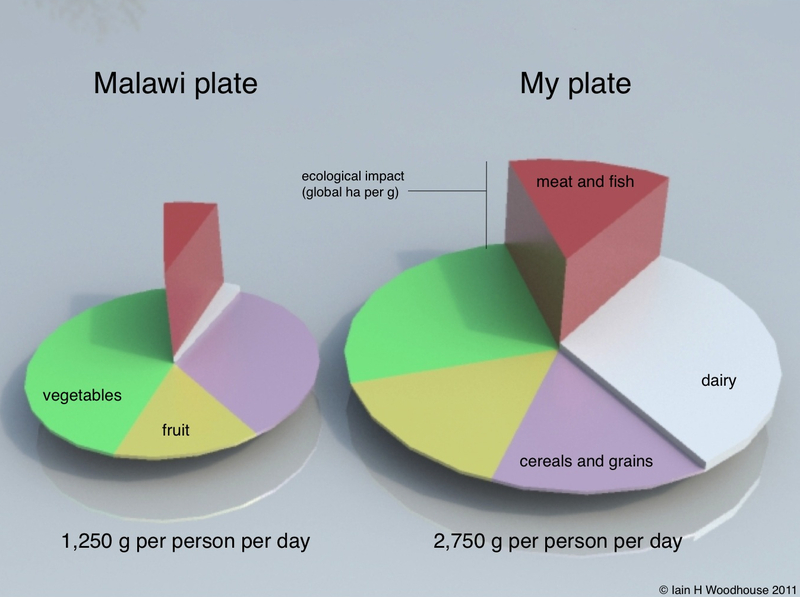 "Malawi plate" is the equivalent for an average Malawian. The size of the plates are in proportion to the daily consumption. The coloured segments correspond to the proportions of food types in our diets -- grains and cereals, meat and fish, dairy, fruit and vegetables. The height of each segment is in proportion to the "global hectares" (a common measure of "ecological footprint") required to produce 1g of the food type. What does this diagram tell you? Clearly I eat more than the average Malawian (although some of that is probably thrown away). I eat more meat and fish, and plenty more dairy. I certainly eat more than I need. What about ecological impact? Our net-impact in this diagram is represented by the volumes of the segments (the amount of food times the impact per foodstuff). Clearly the dominant element is the protein, of which red meat has the largest contribution. Red meat is very expensive, in ecological terms, because beef tastes better when it has fat. You might want lean beef for your heart, but your taste buds want fat. To make the perfect burger you need about 20% fat content (to keep it together, as much as for the taste). Getting a high fat content in a cow is difficult as they won’t get very fat in a natural environment. Eating grass all day is not a quick way to get fat. So cows are fed corn, soy, or some other high energy crop to fatten them up. It increases the mass and energy content, and improves the taste and so increases market value. Dairy cows are also fed supplements to increase their milk yield. The high ecological impact is because you have to grow crops to feed the cows. It takes somewhere in the region of 10 times more land to produce a kg of red meat than a kg of dairy, and 30 times more land than a kg of fruit, vegetables, cereals or grains. And in all cases, new land to produce more of any of this food will more than likely come from newly deforested land. The connection is not always straightforward. Much of the soy and corn grown as livestock feed is grown on land that was previously pasture, or other arable land, and not land that was recently deforested. It is the pasture that is displaced, so that as older pasture is converted, newer pasture is created by deforestation. Pressure on land is coming from all directions. Increasing global population requires more agricultural land. The search for alternatives to fossil fuels is driving a rapid increase in the growth of biofuels, grown on what would otherwise be forest or arable land. And the $1trillion or more annual price-tag associated with deforestation (in terms of their contribution to climate regulation, biodiversity, etc) is likely to lead to a system like REDD aimed at incentivising people to leave the forest as forest. Unfortunately, if you are like me and eat meat, you contribute to this problem. I wouldn’t argue, as some have, that we should all become vegetarians, but there is good reason to reduce the amount of meat we eat. We all know trees are important. We know that its probably a bad thing to cut down the trees. But from our vantage point, the trees appear abundant and the land is important — for biofuels, for food, for livestock feed, because without expansion of the agricultural areas, there won’t be enough to eat. So, do you want forests or food? If, like me, you want both, then eating less meat would be a good place to start. How is this for a solution: for every 1 tonne of food you (you’re country) imports you need 1 food credit and for every 1 you (you’re country) exports you gain 1 food credit. These can be freely traded with countries about to apply for extra food credits based upon viability. For example a desert country that cannot grow much food or a poor country would get them cheaper, but a rich country with good agricultural land should find it more expensive. This price could easily be based on a formalistic model. The result, apart from a lot of grumbling would be restricted flow of food between countries (in this county we have what a 40% net import of food (I don’t know if this accounts for differences in the land required to produce the food) despite rich agricultural land with part of that surely going out of poor countries where hunger is a problem). For countries like the UK, the price of food goes up allowing farmers to plug that 40% gap hopefully one day creating a nominal net flow (and getting rid of those pesky fees for extra food credits). For poor countries that is a reduced flow of food out of their country, cutting employment, but by removing competition with richer countries should ultimately reduce the price of food and create a stronger domestic market. Ultimately employment without food security is largely a con. Meat is accounted for within this by making it 1 tonne of food for 1 credit. If you import 30 tonnes of cereal and export 1 tonne of meat that does not pay off. Hence it reduces the cost and incentivises vegetable, fruit, cereal and grain production over meat production, i.e. making the target land efficiently not marketable value. This is an interesting mode of thinking. It certainly challenges a basic assumption that a country with natural resources is allowed to “profit” from them. Is this a fair system?